There are many different type of ceremonies which can be held during an ash scattering – burial at sea – service. Each person has lived a unique life and their family will choose to remember and celebrate their lives in a unique way. What we have learned from doing this business over several years is that each trip to the ocean is unique, as each life is unique. Something different happens on each trip that is significant to that particular family and has meaning to them. This event can really be anything such as unique wildlife showing us, something a family member does, how the cremains disperse or the cloud formations. Really anythings and we have lots of stories of unique events. A typical ash scattering ceremony is fairly short – around 7 minutes with the family out on the front of the yacht sharing stories of the loved one which has passed. These stories really help all in attendance with the closure needed when someone passes. Often a poem or bible verses are read by either a family member, the captain or the facilitator on the boat. 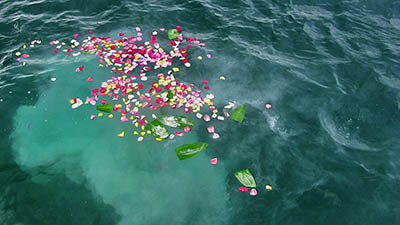 The ash (cremains) are then placed in the ocean. There are many way to accomplish this and will depend on the family’s wishes. Sometimes there is a biodegradable urn and sometimes not. In either case, flowers are almost always present (rose petals as well as others) and they form a trail from the yacht in the oceans current. At this point the ship’s bell is usually rung 8 times – a nautical tradition signifying final watch. A song is usually playing at the same time. The song is selected by the family ahead of time – Amazing Grade, Over the Rainbow or some other appropriate song with meaning to the family. The yacht lingers at the location until the family is ready to leave. Generally the yacht slowly circles the scattering site before the yacht heads back to home port. It is a lovely way to say goodbye and see the person off on the next part of their individual journey. Over the years we have had some very unique ceremonies or sometimes it is the lack of a ceremony as such that makes them unique. Below are just a few for the families that we have had the pleasure of assisting. Christian Ceremonies – Christian ash scattering ceremonies can be either long or short depending on the wishes of the family. 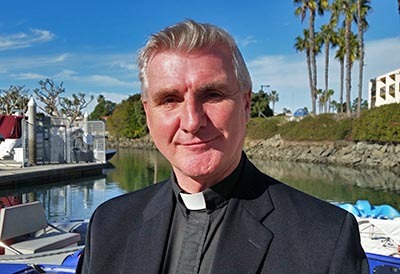 When clergy accompany there can be eulogies and simple or traditional prayers, however the vast majority of charters have no clergy onboard. Most christian denominations allow ashes to be scattered in the ocean in the traditional way. However, Catholics may prefer to use a biodegradable urn – this allows the ashes to remain together during the scattering. Buddhist ceremonies – We do a lot of Buddhist ash scattering ceremonies. Generally they are several monks on board in their yellow or orange robes. They chant over the ashes on the voyage to the ocean and the food offerings. 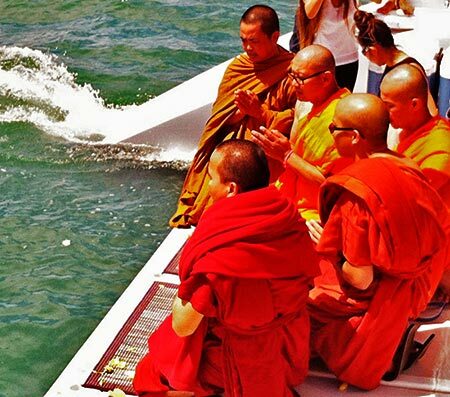 On arriving at the scattering location the monks scatter the ashes in the ocean – chanting all the while. With Buddhist ceremonies everything that is taken on the scattering is scattered – all the flowers. It is bad luck to bring anything back to shore. Scottish bagpipes are a great touch if this is your cultural heritage. Nothing is more haunting than “Amazing Grace” played on the pipes. 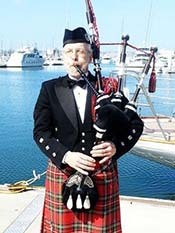 Some other typical pipe songs are the Flower of Scotland, Lord Lovat’s Lament, El Alamein, Ye Banks and Braes etc. Dove release is something that some families enjoy. You can either get 1 or a dozen. Often one is held and released by hand while with the others await in the basket until the lid of the basket is open and they take flight. The doves generally circle the yacht and wait for all birds to join before heading for home. Hawaiian based – This was one of the more unique and lovely ash scattering ceremony events. A hula dance was performed with a some music written especially for this occasion. Sometimes families pour a beer in the ocean saying this one is for you. One lady was scattering her husband and she wore her wedding dress and brought champagne glasses. She scattered the ashes, had a toast and spend the rest of the charter in solitude on the front of the yacht. An ash scattering ceremony on “St. Patrick’s Day” had the family having a toast of Irish Whiskey with the Irish song “Danny Boy” playing on the ship’s stereo system. This was at sunset while dolphins circled the boat.